Spidey battles dastardly villains Sandman and Venom in this third installment of the smash series. 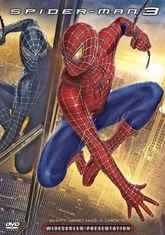 Lightning strikes a third time in this latest installment of director Sam Raimi's hugely successful Spider-man series, based, of course, on the ever-popular Marvel Comics character. More action! More adventure! More villains! Get wrapped up as the webbed superhero (Tobey Maguire) and his girlfriend, Mary Jane (Kirsten Dunst) find themselves caught-up in a love triangle while confrontingthe dastardly deeds of new villains, The Sandman (Thomas Haden Church) and the evil Venom (Topher Grace). This one's a total wow!